While wearing your prosthesis it is common to experience a loss of volume in the limb throughout the day. This is commonly referred to as “sock management” or “volume management”. As your residual limb loses volume, the space between your residual limb and prosthesis will become greater and must be filled. Your prosthetist will provide you with several socks, of various thickness, that will fill in this space. 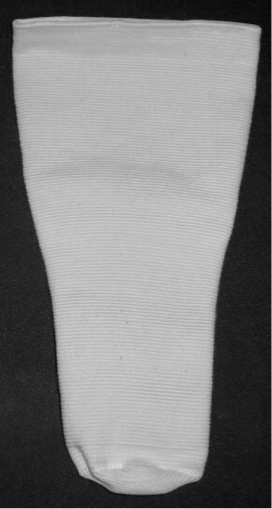 Sock ply is determined by the thickness of the sock. The sock ply can visually be determined by either a number on the sock or the color of the sock stitching. The lower the sock ply, the thinner the sock. It will be your job to determine when socks are required and what size will best fill in the gap. It takes some time to get proficient with this. Be sure to talk with the prosthetist and physical therapist when you have questions. You will be taught how to manage your sock wear. This skill will be frequently reviewed because it is important in maintaining the fit and function of the prosthesis and health of your residual limb.